Avondale, Arizona – April 16, 2012 – The Arts Program at Estrella Mountain Community College (EMCC) is looking for ways to expand its community connections and create new works for its “artistic” future. This year, the art programs at Estrella Mountain Community College (EMCC) and Tolleson Union High School District (TUHSD) are trying something new and creative. EMCC has been asked to judge and host the artwork of the District’s 3rd Annual Juried Student Visual Art Show. EMCC Art Professor Jimmy Fike has been the catalyst for reaching out to the Southwest Valley high schools and communities. “Our arts program is young, but we have a lot of enthusiastic and talented students here at EMCC that are helping it grow. I know how important it is for high school students to know they can continue their studio art course work at the community college level, and this art show gives them an introduction to our campus,” says Fike. 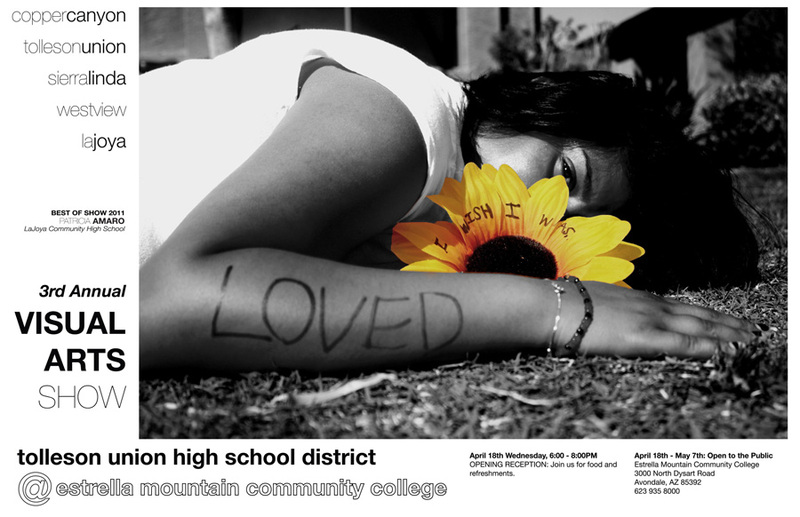 The Opening Reception is on April 18, 2012, from 6:00 – 8:00 p.m. in the Estrella Hall Community Room on the campus of EMCC, located on Dysart and Thomas Roads in Avondale. Awards will be announced at the reception. The high school students’ artwork is being exhibited at various display locations on the EMCC campus through Monday, May 7. The public is welcome to view. The Arts Program at EMCC has plans to become an artistic “hub” for the Southwest Valley as the college prepares for the expansion of its new on-campus Performing Arts Center, with construction slated to start spring 2013. Currently, EMCC offers courses and programs in visual arts, photography, dance, theatre/performing arts, music, fashion, interior design, and more. EMCC will be presenting their own annual arts event, Fine and Performing Arts Week, on April 30 through May 4, where EMCC art students will be able to showcase and celebrate their talents through a wide variety of events, performances, guest artists, and exhibits. Schedule details are being finalized, but many of the activities will be free and open to the public. For more information about art exhibits, events, courses or programs, contact Jimmy Fike at 623-935-8570. Estrella Mountain Community College offers transfer-ready academic courses and job-specific occupational training to approximately 15,000 students annually. The flagship campus is located on Thomas and Dysart Roads in Avondale, and the EMCC Buckeye Educational Center (BEC) is located in downtown Buckeye. Estrella Mountain is part of the Maricopa County Community College District, one of the largest community college districts in the nation. www.estrellamountain.edu or www.maricopa.edu .